Whatever the event, with a choice of materials to suit your budget, we have the right wristband solution for you. Ideal for self promotion, advertising and ticket entry or in addition to identification for visitors and event security. Perfect for pupil or school identification for excursion with emergency phone numbers. We can supply colourful wristbands available in a wide range of colours and finishes, and can even be personalised to your requirements. We can supply your charity event, campaign, festival or meeting with fully customised silicone (rubber) wristbands. They are ideal for promotion and can be used to identify groups of people and signify different groups with different colours (including Pantone matched) or messages on the outside. As well as colour customisation options, bespoke print is available as well as different options for physically ‘impressing’ a slogan, logo or further identification features. They are available in different sizes for infants, children and adults. Stay safe and informed on trips. Pupils can derive a good deal of educational benefit from taking part in visits with their school. In particular, they have the opportunity to undergo experiences not available in the classroom. Most school visits take place without incident, however raising awareness further ensures the safety of pupils, students and any young persons on school visits. 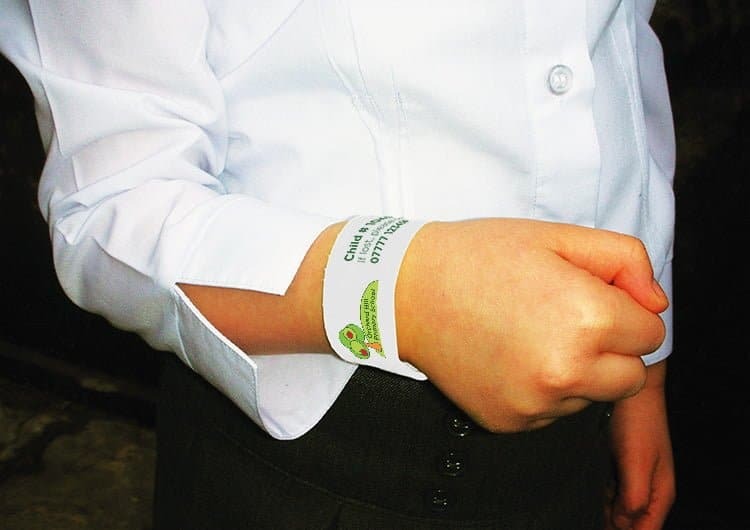 If a child becomes separated from a group, our wristbands can display your school details and contact number to ring, highly visible and secure on each pupil. Whatever the occasion, with a choice of materials to suit your budget, we have the right wristband solution for your organisation. Simple printed self adhesive stickers using a Brother label printer onto pre-purchased wristbands. An economical temporary option, but not tamper resistant. Print your own wristbands using a wristband printer (see below). Single colour print onto a selection of tamper and weather resistant options. Durable pre-printed Tyvek or vinyl wristbands customised to your school requirements. Full customisation with full colour, plus multiple finishes available for wristbands. Silicone (rubber) wristbands, for events and groups of people. Trendy, waterproof, durable and fully customisable – a great advertising tool. We have the ability to print full colour on most materials and some lines are available to purchase with no minimum order quantity! This means you could even have many different designs without having to order huge quantities – have a different design on every trip. 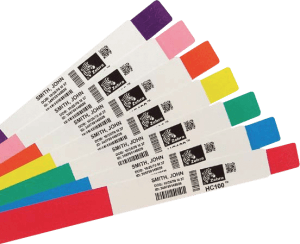 Find out more about printed school wristbands. The Zebra HC100 wristband printer comes with free design software, enabling you to customise the wristband with different designs for specific events. Create reward wristbands or personalise for school outings. Utilise for parent notices such as first aid or ‘bumped head’ style notices. 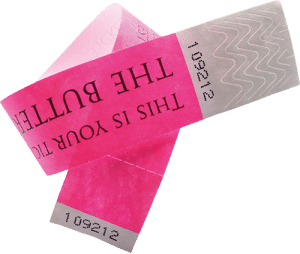 A simple to use, cost effective printer that creates wristbands fast and efficiently without the need for toner or printer ribbons – the only consumables are extra cartridges and of course the rolls of wristbands. 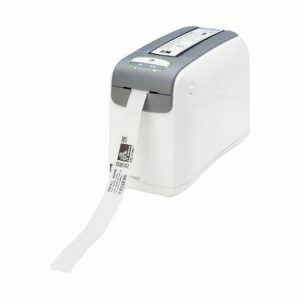 The Zebra HC100 wristband printer is available with either USB or Ethernet connections. Simply load the wristband cartridge and print your designs. For more information on the Zebra HC100 wristband printer, check out the product page here or contact our team for more information. Red, Blue, Green, Yellow, Orange, Pink and Purple. Different levels of wear and tamper resistance are available.